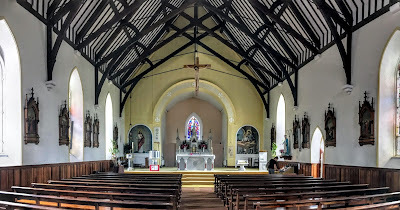 I pass through Glin, Co Limerick, regularly on my way between Askeaton and Tarbert, and although it is part of this group of parishes, the Church of Ireland parish church in Glin has been closed for decades. Glin is on the banks of the Shannon Estuary and is probably best-known as the seat of the Knights of Glin at Glin Castle. 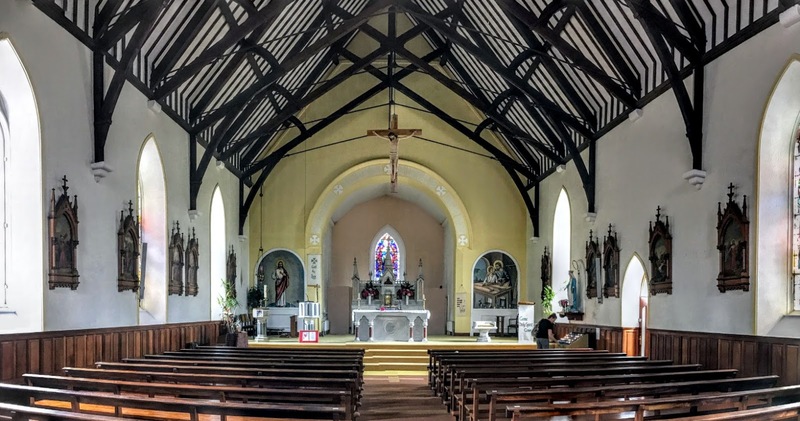 The parish was formerly known as Kilfergus, and Glin takes its name from the Irish Glen Corbraighe, a name that recalls the Corbry tribe who ruled the area until the arrival of John FitzJohn FitzGerald, ancestor of the Knights of Glin, in the 13th century. From around 1400 until 1866, the Knights of Glin were buried in a tomb near the church ruins in Kilfergus. In 1815, a new parish church, Saint Paul’s, was built for the Church of Ireland parish on land that had once been part of the Glin Castle Estate. Half a century later, a new Gothic Revival Church of Ireland parish church was built in Glin in 1865-1870 on a site beside earlier Saint Paul’s Church. This new Gothic Revival church, incorporating the west tower of the earlier church, was a break with the earlier Board of First Fruits single-cell and tower arrangement. The new church had a five-bay nave with a lean-to porch at the west end, a chancel at the east end and a vestry at the south-east corner, beside the chancel. The square-plan, three-stage tower at the south-west, was built in 1871 and incorporated much of the tower of the earlier church. The pitched slate roofs have limestone copings and cast-iron cross finials to the nave, vestry and chancel, including a cast-iron cross finial at the nave and a limestone cross finial at the chancel. The porch has a single-pitched, fish-scale roof. The tower has a limestone spire with a cast-iron cross finial to tower. Canon Thomas Pyne Weldon, who was Rector of Glin for 33 years, died in Glin on 25 January 1894 and is buried in the churchyard. There are lancet stained-glass windows in the nave, paired lancet stained-glass windows in the vestry, south elevation, and a triple lancet East Window in the Chancel. At the west end of the church, there is an oculus in the nave. The church retains most of its original form and massing, as well as the tower, which provides a focal point of the Gothic Revival design. The architect James Edward Rodgers (1838-1896) built the new church within the grounds of Glin Castle. James Edward Rogers was born in Dublin in 1838, the son of James Rogers QC of 20 Upper Mount Street, Dublin. He went to school at Guildford Grammar School, and matriculated at Trinity College Dublin on 2 July 1855. Soon after, he became a pupil of Benjamin Woodward (1816-1861). Woodward died in May 1861, and Rogers graduated BA at TCD Trinity later that year. He may have set up his own architectural practice in 1862, and was working under his own name in 1863. By 1864, he had opened an office at 205 Great Brunswick Street, and his first important commission was the Carmichael School of Medicine in North Brunswick Street. By 1870, he had moved to 179 Great Brunswick Street, where William Stirling and James Franklin Fuller also had their offices. Most of his recorded work was in connection with the Church of Ireland. He was architect to the Diocese of Meath until disestablishment in 1869 and also designed or worked on churches in the diocese of Dublin and in the west of Ireland. As a watercolour artist, he exhibited at the Royal Hibernian Academy from 1870 on. He was elected an associate of the RHA in 1871, and he was elected a Fellow of the RIBA in 1874 on the proposal of James Franklin Fuller, James Joseph McCarthy and Thomas Newenham Deane. He moved to London in 1876. He does not appear to have practised as an architect in England, and he resigned as a fellow of the RIAI in 1874 and as a fellow of the RIBA in 1877. In 1889, Rogers and his old friend JP Mahaffy published Sketches from a tour through Holland and Germany. Soon after, he illustrated the Revd Sabine Baring-Gould’s Troubadour-Land: A Ramble in Provence and Languedoc (1891). He continued to exhibit his paintings at the RHA until the year he died. He died in London on 18 February 1896. His other works include Saint Mary’s Church, Howth, Kenure Church and Rectory, Rush, Holmpatrick Church, Skerries, the former Vicarage at Saint Bartholomew’s Church, Ballsbridge, and the former Caledonian Insurance offices at 31 Dame Street, Dublin. He also enlarged Saint John’s Church, Listowel, Co Kerry. In March 1997, President Mary Robinson opened the Glin Heritage Centre in the former Saint Paul’s Church. The centre is open daily from April to October. On the opposite side of Church Street, the Church of the Immaculate Conception was built in 1858, and is a well-maintained example of a mid-19th century Gothic Revival Roman Catholic parish church built in the decades immediately after Catholic Emancipation. This church was built in 1858. Over the main door, the foundation stone is inscribed with the names of Father John Bunton and Father David Quin, who were parish priest and curate when the church was built. Paired together, these two churches provide an ecclesiastical touch to the view from Glin towards the Village Lodge, with its crenelated towers, built in 1825 and now serving as the main entrance to Glin Castle and the demesne. When Desmond FitzGerald, the 29th and last Knight of Glin, died on 14 September 2011, he was buried with his ancestors in the churchyard of the former Saint Paul’s Church. Glin Castle is the main tourist attraction in Glin, but the Co Limerick village has its own charms. The town was planned in the late 18th century by Colonel John Bateman FitzGerald (1755-1803), the 23rd Knight of Glin, as Glin Catsle was being rebuilt on a new site, and he laid out the spacious Market Square and planned the terraces of Georgian town houses. The two parish churches, Church of Ireland and Roman Catholic, form a pair of Gothic Revival churches at the west end of Church Street, enclosing the entrance to Glin Castle at the Village Lodge. But other buildings of architectural interest in Glin include a fine Georgian pub, a terrace of elegant Georgian townhouses facing the Shannon Estuary and the coastline, and a 200-year-old Bridewell that has also served as a courthouse and is now a library. Glin is typical of the places that inspired John Betjeman’s poem, The Small Towns of Ireland. O’Shaughnessy’s bar encloses the south side of the Market Square at the top of the Main Street and frames the vista from the Shannon Estuary into the town, giving Glin a picture-postcard streetscape. This end-of-terrace, nine-bay, two-storey house and shop was built ca 1790, and the later 19th century additions include a timber shopfront and porch at the front. This shopfront has pilasters supporting the fascia and a carved cornice. O’Shaughnessy’s is an imposing building in the heart of Glin. Its height, leangth and windows are well balanced and in keeping with the rest of the street line. It retains its historic form and composition, along with much of its fabric, including the slate roof, sash windows and carriage arch. The O’Shaughnessy family who give their name to this pub claim descent from Sir Dermot O’Shaughnessy, from Gort, Co Galway, who was knighted in the reign of Henry VIII. After the Treaty of Limerick was signed, Thomas O’Shaughnessy, a great-grandson of Sir Dermot, moved to Glin and this branch of this family has lived in Glin since 1692. In the late 19th century, Pat O’Shaughnessy acquired the long building on the Market Square in Glin and ran his business as a grocery, hardware shop and builders’ suppliers, as well as a public house. The business was inherited by his cousin, Mossy O’Shaughnessy, who also inherited the pub and the family debts. In his time, the pub was also known as the Ivy House. When another Mossy O’Shaughnessy died in 1952, and the pub passed to Captain John O’Shaughnessy, who returned from London in 1952 and his Hungarian-born wife Dorrit (‘Dody’) Meer. While they ran the pub, it was also known locally as ‘The Captain’s,’ and his regular visitors include John B Keane. When Captain John died at the age of 82 in 2002, the pub was inherited by their son Thomas and his wife Val. The pub is now being run by a sixth generation of the O’Shaughnessy family, but is only open on Friday evenings, at weekends and on some mornings in the week. I have yet to visit the pub, but I understand that inside this Georgian inn still retains its original panelling, flooring and shelving, as well as furnishing and artefacts acquired by generations of the O’Shaughnessy family, and extensive courtyards and gardens designed by Dody O’Shaughnessy. Leading up the Main Street, on the right-hand (west) side, Glin Library was built as the Bridewell in 1829. It has a main three-bay, two-storey centre bay that is flanked on each side by recessed, two-bay, single-storey wings. As the Bridewell, it played an important role in the story of Glin, and was used to detain prisoners and hold trials. After the new garda station was built on Church Street, prisoners were no longer kept in the Bridewell. But court cases continued to be held there, and it became known as the courthouse. The building has retained its original stripped down austere form and many of its original salient features. It is set within its own boundary walls, complete with a well-rafted limestone pedestrian entrance, and the building forms an interesting part of the architectural heritage of Glin. Hamilton Villa is a detached three-bay two-storey L-plan house, built ca 1820 by John Hamilton, who strongly influenced the shape and layout of Victorian Glin. This attractive, well-proportioned house, facing the Shannon Estuary, still has distinctive features that are characteristic of domestic architecture in mid-19th century. However, its Georgian features are masked in part by the timber glazed porch at the front, hiding the elliptical opening and spoked fanlight over the timber-panelled door. Immediately east of Hamilton Villa, Hamilton Terrace is a pleasant terrace of well-proportioned Georgian houses built by John Hamilton at the same time, around 1820. One of the houses on Hamilton Terrace served as the Vicarage of Kilfergus or Glin Parish. The Revd Edward Ashe, one of my predecessors in this group of parishes, was Vicar of Kilfergus and Vicar of the neighbouring parish of Aghavillin (Ballylongford) and Kilnaughtin (Tarbert), for 43 years. He died on 1 April 1861 at Hamilton Terrace, Glin, at the age of 71. He had succeeded his father, Canon William Ashe (1747-1836), as Vicar of Kilfergus. In the heart of Glin, a sculpture by local artist Pat O’Loughlin celebrates the life of Margaret Moloney (1868-1952), who was the world’s only known female harbour master. She died in 1952 just under the age 84, making her also the world’s oldest harbour master. Maggie Moloney took over the position of harbour master in Glin from her brother in 1919. She was known as the ‘First Lady of the Estuary’ and when she died, the position of harbour master discontinued and in turn Glin ceased to function as a commercial port.